In May, the National Oceanic and Atmospheric predicted an "above-normal" season. camera (Jose Romero/AFP/Getty Images) This satellite image obtained from the National Oceanic and Atmospheric Administration (NOAA) shows (L-R) Category 1, Hurricane Katia; Category 5, Hurricane Irma and, Category 1, Hurricane Jose, Sept. 7, 2017. 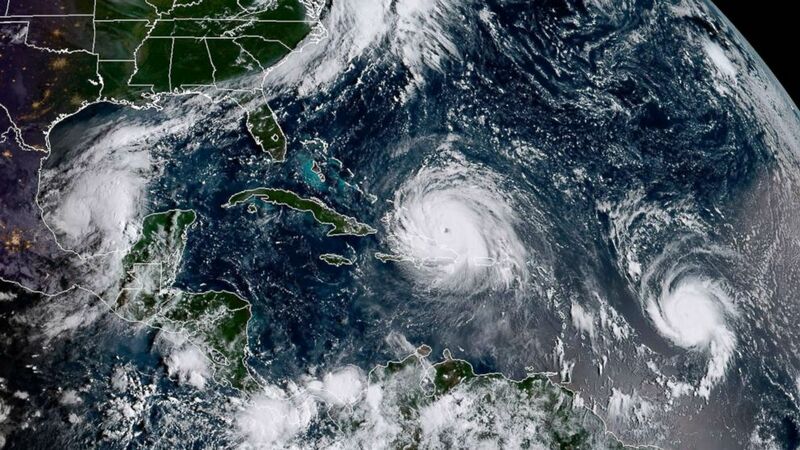 Four hurricanes have formed in the Atlantic in the past three weeks, but hurricane season is far from over, according to the National Oceanic and Atmospheric Administration. Meteorologists predicted the 2017 hurricane season to be a busy one, and the activity may continue in the coming months, Dr. Gerry Bell, lead seasonal hurricane forecaster for NOAA, told ABC News. "We certainly expect more storms to come," Bell said. The official hurricane season runs from June 1 to Nov. 30, but the most active months are August, September and October, Bell said. "We right in the heart of an active season right now," he said. 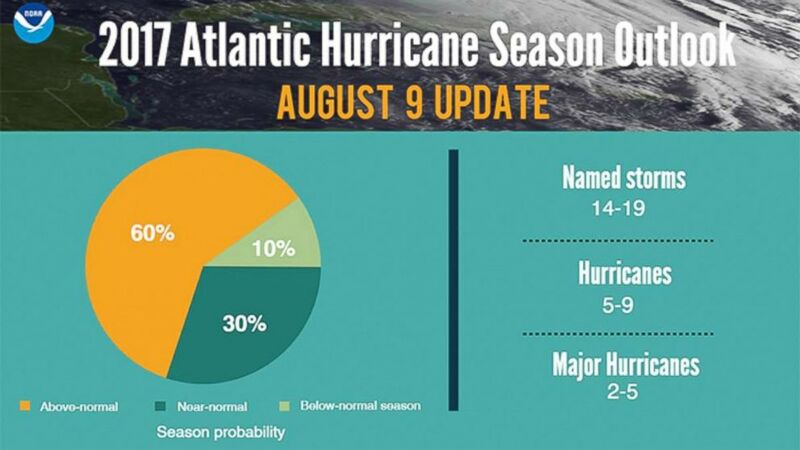 Ahead of the season, on May 25, NOAA said in a press release that the "Atlantic could see another above-normal hurricane season this year," predicting a 45 percent chance of an above-normal season. (NOAA) As of Aug. 9, the National Oceanic and Atmospheric Administration predicted that the 2017 hurricane season would yield between two and five major hurricanes. On Aug. 9, the likelihood of an above-normal season was increased to 60 percent, the NOAA said. The Aug. 9 update predicted that the season could see between 14 to 19 named storms, five to nine hurricanes and two to five major hurricanes. So far, the 2017 hurricane season has seen 11 named storms, six hurricanes and three major hurricanes -- including Harvey, Irma and Jose, Bell said. "There's still room to go as far as what we predicted for the upper ranges of activity," Bell said. 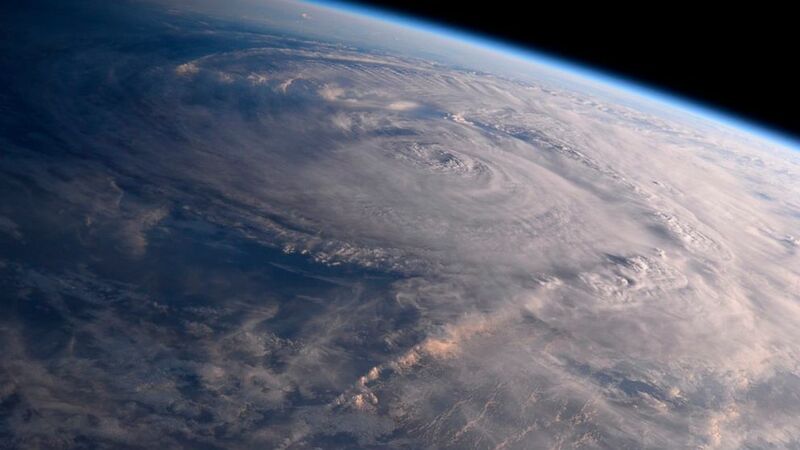 (Randy Bresnik/NASA via AP) Harvey is pictured over Texas from the International Space Station, Aug. 26, 2017. Bell blamed the continuous storms on several atmospheric conditions, including the temperature of the Atlantic Ocean, which is currently 1 to 2 degrees above average. "That certainly favors more hurricanes," he said. 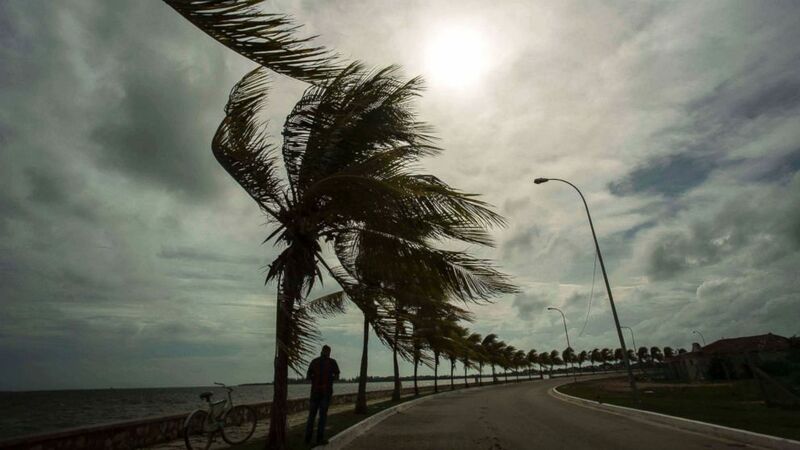 (Desmond Boylan/AP) Winds brought by Hurricane Irma blow palm trees lining the seawall in Cuba, Sept. 8, 2017. The wind shear -- the change in the wind's direction or speed with increasing altitude and the most effective hindrance for a tropical system -- has also been weak in the Atlantic, Bell said. If a wind shear is high, it can hinder the formation of a tropical system. If the system is already formed, the wind shear can tear it apart. Another factor that has affected the number of storms this season is the wind pattern, Bell said. 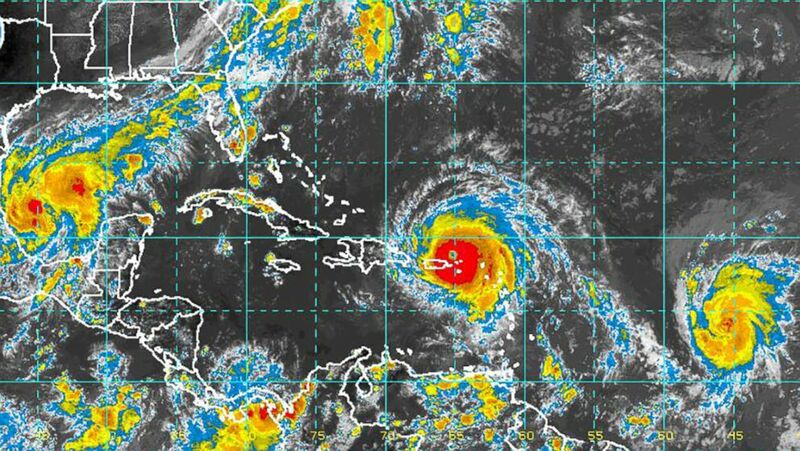 The wind patterns coming out of Africa are "helping to spin up a lot of these storms." The wind patterns are "certainly the most conducive" -- more than anything else -- to the formation of a hurricane, Bell said. (NOAA) An image released by NOAA on Sept. 6, 2017, shows Hurricanes Katia, Irma and Jose. With more major storms possible "the most important thing right now is that people are prepared," Bell said.